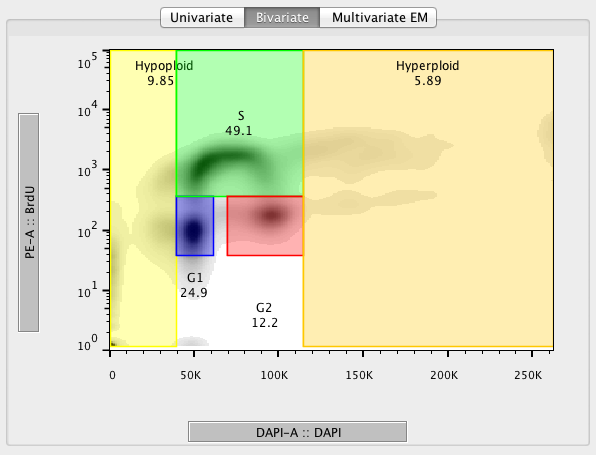 The Bivariate Cell Cycle platform produces population statistics for each of the three main cell cycle populations (G1, S, and G2), as well as for hypoploid and hyperploid cells. 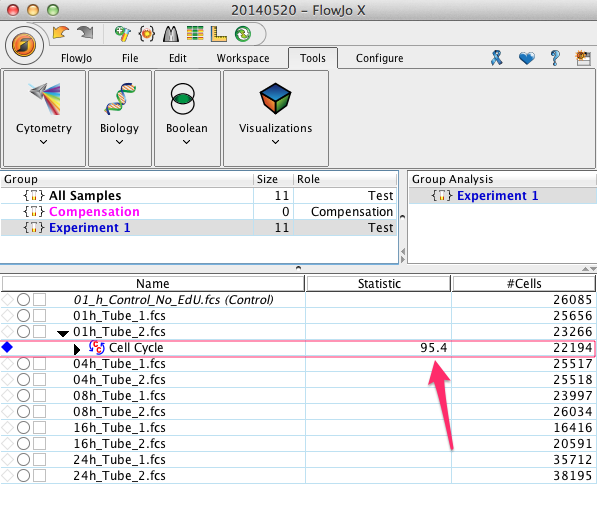 This page is under construction; stay tuned for FlowJo Version 10 with Cell Cycle. A bivariate Median Fluorescent Intensity (MFI) of the two parameters used, typically a measure of DNA content like PI and an S-phase determinant like BrdU. The percent of events assigned to each population relative to the parent population. These statistics are placed in a table within the model window, with the colors and labels matching the graphic portion of the model window as shown in Figure 1. The statistics also appear in the workspace automatically as well, as shown in Figure 2. The statistics will update if the user manually adjusts the gates created by the model in the cell cycle platform window. Additionally, the bivariate model automatically creates a node for each population in the Workspace. You may add any additional statistic in the traditional manner through the Statistics band.